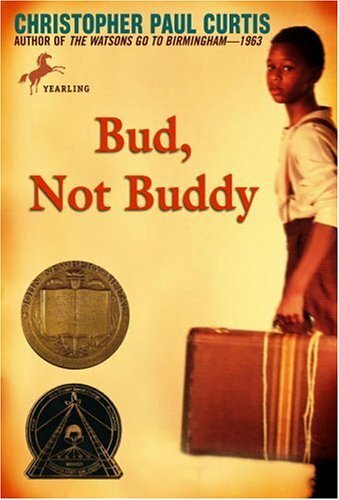 Teachers — Here are three free resources for your use when you teach Bud, Not Buddy, a great historical choice for the classroom. Just click to open, and save and print as needed! Feel free to share these freebies with a teacher who might use them. There’s an editable Word version followed by a pdf for each. The indomitable Christopher Paul Curtis came to speak at a writers’ residency I attended years ago. He talked about the importance of keeping the story at the heart of the book (as opposed to the history) when you write historicals. Bud, Not Buddy has excellent attributes for instruction: character voice and development, the “quest” or journey plot structure, great morals and themes…and history as a vivid backdrop that impacts the story without taking over. I used this book in a 5th grade Language Arts classroom, but it would fit into a variety of grade levels and content areas, and it would be a great choice for homeschool audiences as well. Fast summary: Ten-year-old Bud escapes a not-so-nice foster situation, but instead of heading back to the “home,” he decides to find his father. He’s never met him, but he’s certain the clues in his suitcase left by his mother before she died will be all the help he needs in finding the man. Set against the background of the Great Depression, the various lifestyles Bud experiences (as an orphan, a vagrant, a traveling musician) take the reader solidly into another time and place. Note for teachers/homeschooling parents: Bud, Not Buddy has so many teachable moments! You can sidebar social studies, writing, morality, and arts topics with every chapter: What’s a Hooverville? What’s a worker’s union? Find some examples of people caring for others in the book. How does jazz music differ from music of other genres? Real (modern) world connections: The book centers around Flint, Michigan. Students may bring up the current status of Flint, which might spur a discussion of other American cities and how they have developed over time. Any alarms/flashing lights? (Potentially controversial facets of the book): There’s a brief scene in which Bud gets a kiss from a girl he doesn’t see again. Some discussion of race relations in the 1930s would deepen students’ awareness and understanding of Bud’s decisions and emotions. Bud imagines using a rifle he finds at the foster home, but doesn’t. Notes for writers/readers: Study this book as a great example of voice! My fifth graders were quick to point out all the grammar “mistakes” on page one, which immediately prompted a good lesson on voice and style, what voice means for deep characterization in a novel, and descriptions of POV. A great MG read — can’t wait to teach this one again.